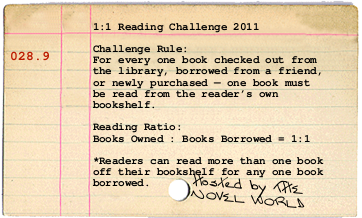 The 1: 1 Reading Challenge will span January – December 2011. Cookbooks, craft books, gardening & home improvement. These books will be exempt from the ratio. Sounds pretty easy right? I have this bad habit of splurging at library bookstores where books can cost as little as 25 cents. This is my attempt to preserve what little shelf space I have on my two bookshelves, both of which are already filled to capacity. I’ll be keeping a monthly statistics log with the following information updated on the 1st of each month. I am aware that there are many similar challenges floating around the hundreds of book blogs in cyberspace. While everyone and anyone is more than welcome to follow my model and rules, this will not be a very formal challenge. I have a bad track record with challenges. This is really just a way to motivate myself to read more of the books that I own and to be more particular about the books that I bring into my apartment to put on my bookshelf. I often turn to the library stacks or go to my favorite used bookstores for new selections because I never want to read the books on my bookshelf. Why did I buy these books in the first place? I had an interest in them when I selected them. They went through a rather strict selection process. I usually spend about 5 minutes perusing a book before making my final purchase. As it stands, I’ve read about a third of all the books that I live with. In an ideal world, only have a third of my books should be unread. The challenge will begin bright and early January 1st. Until then, I have roughly a week to prepare my bookshelves and myself for this challenge. This entry was posted in Blogging, Books, Libraries and tagged 2011, Books, Reading Challenge. Bookmark the permalink. 5 minutes perusing?! I often mull over a book for weeks to months before I buy it! I might just follow your lead on this one. I might even make it a bit more stricter for myself and do it a read 3 book and buy 1 ratio. Even my Nook is starting to fill up. UGH.